Notes about photos, starting with the top left. 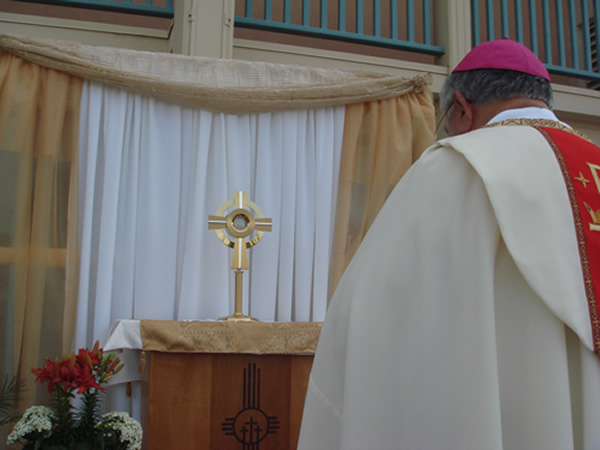 1)The Most Holy Eucharist exposed with Bishop Ramirez in front of St. Genevieve's during the Feast of Corpus Christi, 2)The band playing Eucharistic hymns, 3)Fr. Don Adamsky and pilgrims from Tortugas in the procession, 4)Seminarian Chris Williams acting as incense barer for the Bishop, 5)Julia Holguin and Seminarian Alejandro Urena providing music, 6)Fr. Juan Moreno and Fr. Carlos Espinoza leading the Eucharist and the Bishop (under the canopy) - escorted by the Knights of Columbus, 7)Close-up of the Monstrance and the Bishop Ramirez, 8)Our Lady of Health Parish Band playing Eucharistic hymns, 9)Matachines escorting the procession, 10)Another view of the Matachines, 11)The Eucharist and the Bishop in the downtown mall, 12)St. Genevieve Monument at the Old Downtown Mall, 13)The new St. Genevieve sign in front of the Church, 14)Statue of the Sacred Heart of Jesus.